JOHANNESBURG, 8 FEBRUARY 2019 – Despite 2018 being a generally challenging year for both the global and domestic economy, the Metals and Engineering (M&E) sector is poised for a third annual consecutive growth in 2019. 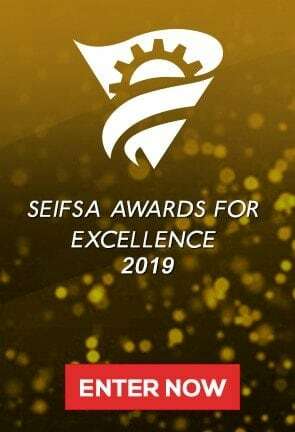 This is according to the Steel and Engineering Industries Federation of Southern Africa (SEIFSA), which this morning officially released its authoritative State of the Metals and Engineering Sector Report for 2019-2020. Gien the auspicious performance of the M&E cluster of industries in recent years, this year’s Report was published under the theme of “Sharpening the saw – continuously improving industry activity and competitiveness”. SEIFSA Chief Economist Michael Ade said the Federation’s forecast is for the entire M&E sector to expand moderately by 1.8% in 2019. However, the various sub-sectors will register varied levels of growth, with some expanding and others contracting in 2019. “The prognosis aligns with the outlook for both a moderating global growth and domestic growth in 2018, underpinned by a slowdown in the pace of recovery in commodity exporters, deceleration of growth in commodity importers, a slowdown of growth in global goods and industrial activity during the first half of 2018 and the imposition of broad-based tariffs by the United States on steel and aluminium imports. These developments have serious implications for the growth prospects of the M&E sector, which exports the bulk of its iron and steel products,” said Dr Ade. Prices of most metals weakened in 2018, largely due to concerns about the effects of tariffs on global growth and trade, with industrial metals particularly responsive to these concerns, given their many uses in the manufacture of tradable goods. However, the expectation is for metal prices generally to stabilise in 2019 and 2020, thereby strengthening exports and improving growth prospects for commodity exporters – including the M&E cluster of industries – along with enhanced capital inflows. However, this view is not without downside risks. These include the persistence of trade tensions, diminishing industrial activity, softening of international trade and investment and substantial financial market pressures on some large emerging market and developing economies (EMDEs). Dr Ade said that trade tensions between the US and China, including the imposition of tariffs on an array of products, have had varying effects on metal and agricultural commodities. He said the tensions, which affected roughly 2.5% of global goods trade and had implications for South Africa, continue to remain elevated. Dr Ade said tighter external financing conditions – which contributed to significant capital outflows and more significant currency pressures in more vulnerable EMDEs, including South Africa – have the propensity of increasing external borrowing costs and the general cost of doing business, also negatively affecting production and foreign fixed investment into the sector. “To confront this increasingly difficult environment, the most urgent priority is for EMDE policymakers to prepare for possible bouts of financial market stress and rebuild macroeconomic policy buffers as appropriate. Equally importantly, policy makers have to foster stronger potential growth by boosting human capital, removing barriers to investments and promoting trade integration within a rules-based multilateral system,” said Dr Ade. He said that despite these downside risks, the M&E sector’s moderate growth prospects in 2019 is influenced by the positive growth prospects for key industries which are important markets for the M&E sector’s intermediary products and are crucial in the sector’s value chain. He said the performance of the domestic economy, which is forecast to grow at 1.3% in 2019 and 1.7% in 2020, supported by continuous improvement of regional markets in Africa, would also impact positively on the sector’s growth prospects. According to Dr Ade, Sub-Sahara Africa is envisaged to improve moderately in 2019 (3.4%) and in 2020 (3.6%), providing a basis for more exports from the M&E sector. He said it was likely that this would translate into continued exports, bringing in much-needed foreign currency. He said this was especially so given the fact that Africa is the highest export destination for goods produced by companies in the M&E cluster. Dr Ade said that 2018 was yet another better year for the M&E sector as it expanded for the second consecutive year, registering an improved estimated annual growth of 2.0%, despite facing serious structural headwinds, including a technical recession in the broader economy. He said the momentum was expected to continue in 2019. “Given the recent resilience in production in the M&E sector, despite companies facing domestic headwinds, a need exists to ensure that the sector remains attractive by directly reducing increasing intermediate input costs and managing borrowing costs in order to improve consistently on the bottom line, exists,” Dr Ade concluded.